This is the most common thermocouple type that provides the widest operating temperature range. Type K thermocouples generally will work in most applications because they are nickel based and have good corrosion resistance. •1.Positive leg is non-magnetic (Yellow), negative leg is magnetic (Red). •2. Traditional base-metal choice for high temperature work. •3. Appropriate for use in oxidizing or inert atmospheres at temperatures up to 1260°C (2300°F). •4. Vulnerable to sulfur attack (refrain from exposing to sulfur-containing atmospheres). •5. Perform best in clean oxidizing atmospheres. •6. Not recommended for use under partially oxidizing conditions in vacuum, or when subjected to alternating cycles of oxidization and reduction. Composed of a positive leg, which is approximately 90% nickel, 10% chromium and a negative leg, which is approximately 95% nickel, 2% aluminum, 2% manganese and 1% silicon.Type K Thermocouples are the most common general purpose thermocouple with a sensitivity of approximately 41µV/°C, chromel positive relative to alumel. It is inexpensive, and a wide variety of probes are available in its -200°C to +1260°C / -328°F to +2300°F range. Type K was specified at a time when metallurgy was less advanced than it is today, and consequently characteristics vary considerably between samples. 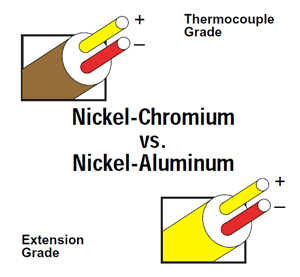 One of the constituent metals, nickel, is magnetic; a characteristic of thermocouples made with magnetic material is that they undergo a step change in output when the magnetic material reaches its Cure Point (around 354 °C for type K thermocouples). Type K thermocouples usually work in most applications as they are nickel based and exhibit good corrosion resistance. It is the most common sensor calibration type providing the widest operating temperature range. Due to its reliability and accuracy the Type K thermocouple is used extensively at temperatures up to 2300°F (1260°C). This type of thermocouple should be protected with a suitable metal or ceramic protection tube, especially in reducing atmospheres. In oxidizing atmospheres, such as electric furnaces, tube protection is not always necessary when other conditions are suitable; however, it is recommended for cleanliness and general mechanical protection. Type K will generally outlast Type J because the JP wire rapidly oxidizes, especially at higher temperatures. 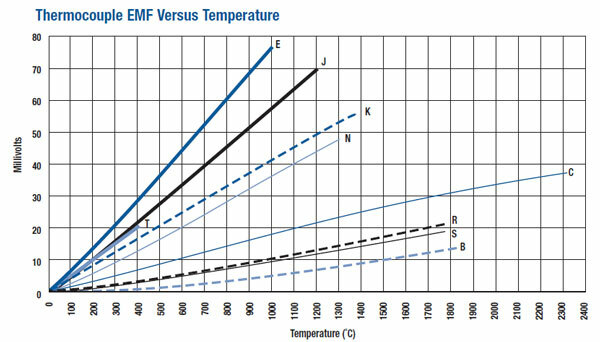 Deviations in the alloys can affect the accuracy of thermocouples. 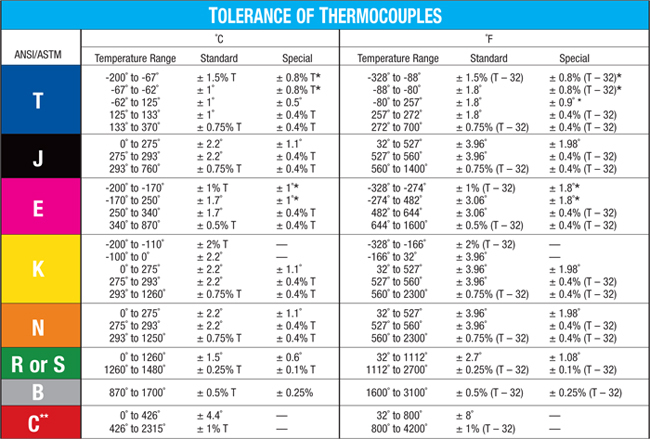 For type K thermocouples the tolerance class one is given as ± 1.5 K between -40 and 375 °C. However, deviations between thermocouples coming from the same production are very small and a much higher accuracy can be achieved by individual calibration. Metallurgical changes can cause a calibration drift of 1 to 2°C in a few hours, increasing to 5 °C over time. A special grade of Type K is available that can maintain special limit accuracy up to ten times longer than the regular grade. Type K thermocouples are used for measurements in many different types of environments such as water, mild chemical solutions , gases and dry areas. Engines, oil heaters and boilers are examples of places where they may be found. They are used as thermometers in hospitals and the food industry. •Good linearity of emf to the measurement temperature. •Good resistance against oxidation below 1000°C (1600°F). •Most stable among thermocouple of inexpensive material. •Not suitable for reducing atmosphere but will withstand metallic vapor. •Aging of the emf characteristic, in comparison to thermocouples of noble materials(B, R, and S). A coupling of Chromel and Alumel wires, has a range of -270 °C to 1260 °C and an output of -6.4 to 54.9 mV over maximum temperature range. This is one of the major advantages of thermocouple type k over other thermocouples in general or other temperature transducers such as the thermistor or the resistance temperature detector (RTD). Its capability to function in rugged environmental conditions and in various atmospheres makes it a preference over other temperature transduction devices. Thermocouple devices must use the appropriate wire because different wires measure various temperature ranges. Type K is popular because of its wide temperature range. Of the four major thermocouple types, type K covers the widest range from−200°C to 1,260°C (approximately minus 328°F to 2,300° F). When protected or isolated with ceramic beads or insulation material. When protected by compacted mineral insulation and outer metal sheath (MGO). Type K is usable from -35 to 1260°C (-32 to 2300°F). If the application is between 600 to 1100°F, we recommend Type J or N because of short range ordering that can cause drift of +2° to +4°F in a few hours time. Type K is relatively stable to radiation transmission in nuclear environments. For applications below 0°C (32°F), special alloy selections are usually required. 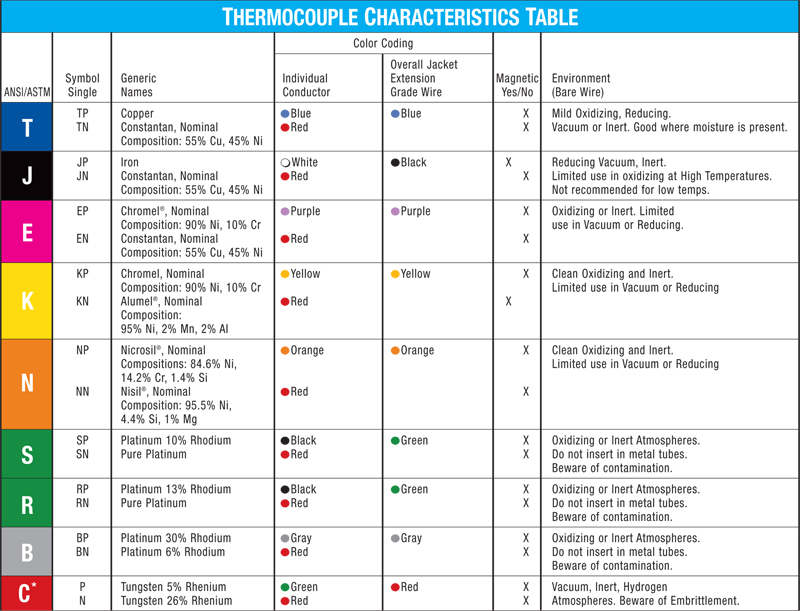 Thermocouple wire sensitivities and margins of error are considerations when selecting a type. Type K has a higher margin of error than other types of thermocouple wire; manufacturers that choose this type are generally willing to sacrifice accuracy for the wide range of sensitivity. Type K has a margin of error related to a percentage of the temperature measured. It is roughly 0.75‰ or 2.2°C, whichever is greater. Type K has an exponentially increasing voltage the differences in voltages become easier to measure and more accurate at higher temperatures. At very cold temperatures minus 260° C to minus 250° C type K thermocouple voltages differ only one or two thousandths of a millivolt for every degree Celsius. At extremely high temperatures around 1,350°C voltage differs about 3.3 hundredths of a millivolt per degree Celsius. Uncoated wire probes respond more quickly to temperature. Coated wires display different response times in different media. Some test subject chemicals might damage exposed probes and wires. A 1/4-inch wide, sheathed, ungrounded type K thermocouple responds to temperature changes in water in about 2.25 seconds. A bare thermocouple wire responds in just over 0.6 seconds. This is the most common junction style. A thermocouple is grounded when both thermocouple wires and the sheath are all welded together to form one junction at the probe tip. Grounded thermocouples have a very good response time because the thermocouple is making direct contact with the sheath, allowing heat to transfer easily. A drawback of the grounded thermocouple is that the thermocouple is more susceptible to electrical interference. This is because the sheath often comes into contact with the surrounding area, providing a path for interference. A thermocouple is ungrounded when the thermocouple wires are welded together but they are insulated from the sheath. The wires are often separated by mineral insulation. A thermocouple is exposed when the thermocouple wires are welded together and directly inserted into the process. The response time is very quick, but exposed thermocouple wires are more prone to corrosion and degradation. Unless your application requires exposed junctions, this style is not recommended. Thermocouple conductors come in a variety of sizes. Depending on your application, the gauge selected will affect the thermocouple's performance. The larger the gauge size, the more thermal mass the thermocouple will have with a corresponding decrease in response. The larger the gauge size the greater the stability and oper-ating life. Conversely, a smaller gauge size will have a quicker response, but may not deliver the stability or oper-ating life required. Maximum temperature: 1650. Best corrosion resistance of the austenitic stainless steel grades. Widely used in the food and chemical industry. Subject to damaging carbide precipitation in 900°F to 1600°F (482°C to 870°C). Maximum temperature: 1650°F (900°C). Same as 316 SST (04) except low carbon version allows for better welding and fabrication. Maximum temperature: 1650°F (900°C). Most widely used low temperature sheath material. Extensively used in food, beverage, chemical and other industries where corrosion resistance is required. Industry: Subject to damaging carbide precipitation in 900 to 1600°F (480 to 870°C) range. Lowest cost corrosion resistant sheath material available. Maximum temperature: 1650°F (900?C). Low carbon version of 304 SST (02). Low carbon content allows this material to be welded and heated in the 900 to 1600°F (480 to 870°C) range without damage to corrosion resistance. Maximum temperature: 2100?F (1150?C). Mechanical and corrosion resistance, similar to but better than 304 SS. Very good heat resistance. This alloy contains 25% chromium, 20% nickel. Not as ductile as 304 SS. Maximum temperature: 1600°F (870°C). Similar to 304 SS except titanium stabilized for intergranular corrosion. This alloy is designed to overcome susceptibility to carbon precipitation in the 900 to 1600°F (480 to 870°C) range. Used in aerospace and chemicalapplications. Maximum temperature: 2100°F (1150°C). Ferritic stainless steel which has good resistance to sulfurous atmospheres at high temperatures. Good corrosion resistance to nitric acid, sulfuric acid and most alkalies. 27% chromium content gives this alloy the highest heat resistance of any ferritic stainless steel. Maximum temperature: 2150°F (1175°C). Most widely used thermocouple sheath material. Good high temperature strength, corrosion resistance, resistance to chloride-ion stress corrosion cracking and oxidation resistance to high temperatures. Do not use in sulfur bearing environments. Good in nitriding environments. Maximum temperature: 2150°F (1175°C) continuous, 2300°F (1260°C) intermittent. Similar to Alloy 600 with the addition of aluminum for outstanding oxidation resistance. Designed for high temperature corrosion resistance. This material is good in carburizing environments, and has good creep rupture strength. Do not use in vacuum furnaces! Susceptible to intergranular attack by prolonged heating in 1000 to 1400°F (540 to 760°C) temperature range. Maximum temperature: 2000°F (1095°C). Widely used as heater sheath material. Minimal use in thermocouples. Superior to Alloy 600 in sulfur, cyanide salts and fused neutral salts. Susceptible to intergranular attack in some applications by exposure to the temperature range of 1000 to 1400°F (540 to 7607deg C). A thermocouple circuit contains the two alloy junctions, wire sand connectors and a voltage measuring device. When the two junctions are experiencing different temperatures, measurable current flows through the circuit. The current is related to the temperature differential. Because the measurement is relative, one of the temperatures must be known in order to calculate an absolute temperature. In early thermocouples, one junction was kept at 0° C by immersing it in an ice water bath. Today, one of the junctions, the "cold junction," is electrically compensated to maintain a standard. The other junction, the "hot junction," is exposed to the environment to be measured. A Type K thermocouple can be connected to a voltmeter for simple data collection. In this case, the output is a voltage, and the reader has to convert the voltage level to temperature using a conversion formula. To record data, the thermocouple can be connected to a data logger or a data acquisition system to store collected data. In these cases, a conversion circuit or a software operation can be used to calculate the temperature using the voltage output. Like all thermocouples, they are inexpensive, have a fast reaction time, are small in size and are dependable. They can accurately measure extreme temperatures. Depending on where they are manufactured, these range from −270° to 1,370° degrees C or Celsius, with errors within 0.5 to 2 degrees C. They have a sensitivity that is approximately 41 microvolts per degree C.
K types are more generally used at temperatures above 540 degrees C. To limit excessive error, the recommended usage is in oxidizing or completely inert atmospheres with a range of −200° to 1,260° C.
All thermocouples have some disadvantages. They need to be calibrated very carefully before usage. Their output signals are very small and so they may have a problem with noise. They are prone to stress , strain and corrosion, particularly as they age. K types, however, have special problems. Type K thermocouples are only stable for short periods at certain temperatures, after which they tend to drift in a positive direction . The size of the drift is dependent on the temperature. For example, at 1,093° C, their readings may be off by as much as five degrees. Alternate or cyclical exposure below 371° and above 760° C yields unstable measurements. Prolonged exposure from 427° to 649°C makes them age faster. The chromel element is subject to what is known as "green rot." When this happens, the chromium becomes oxidized and turns green and corroded. This occurs in reduced oxygen environments from 815° to 1,040°C. Such depleted-oxygen environments are called reducing, and K-type thermocouples should never be used in either reducing or cyclically oxidizing and reducing atmospheres. Also, they should not be used in sulfurous environments because they will become brittle and break rapidly. The presence of chromium makes them unsuitable for vacuums, save for short periods of time. This is because vaporization may occur. The problems may be minimized by using them within the recommended temperatures and environments. Careful calibration, installing them with the proper connectors and wires, and using compensation circuits also serve as aids. K types constructed to reduce the errors include those that are well insulated, pre-aged or are annealed above their operating temperatures. Some users also take care to replace them often. Others switch to type N, which was specifically constructed to be an improvement over K.